German singer; born at Mayence Feb. 17, 1816; died at Vienna Feb. 24, 1857. In 1829 she accompanied her eldest sister, Sabine, to Paris, where the latter sang at the Italian opera with Sontag and Malibran. Malibran made a deep impression on Klara, who decided to devote her life to art. 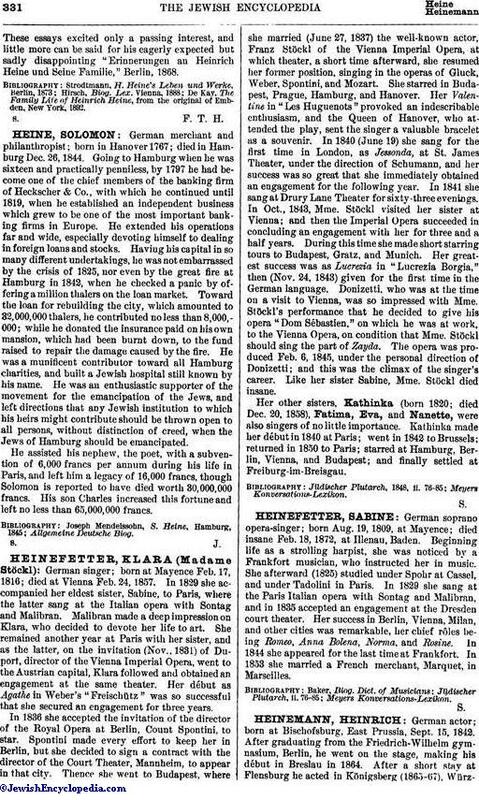 She remained another year at Paris with her sister, and as the latter, on the invitation (Nov., 1831) of Duport, director of the Vienna Imperial Opera, went to the Austrian capital, Klara followed and obtained an engagement at the same theater. Her début as Agathe in Weber's "Freischütz" was so successful that she secured an engagement for three years. In 1836 she accepted the invitation of the director of the Royal Opera at Berlin, Count Spontini, to star. Spontini made every effort to keep her in Berlin, but she decided to sign a contract with the director of the Court Theater, Mannheim, to appear in that city. Thence she went to Budapest, where she married (June 27, 1837) the well-known actor, Franz Stöckl of the Vienna Imperial Opera, at which theater, a short time afterward, she resumed her former position, singing in the operas of Gluck, Weber, Spontini, and Mozart. She starred in Budapest, Prague, Hamburg, and Hanover. Her Valentine in "Les Huguenots" provoked an indescribable enthusiasm, and the Queen of Hanover, who attended the play, sent the singer a valuable bracelet as a souvenir. In 1840 (June 19) she sang for the first time in London, as Jessonda, at St. James Theater, under the direction of Schumann, and her success was so great that she immediately obtained an engagement for the following year. In 1841 she sang at Drury Lane Theater for sixty-three evenings. In Oct., 1843, Mme. Stöckl visited her sister at Vienna; and then the Imperial Opera succeeded in concluding an engagement with her for three and a half years. During this time she made short starring tours to Budapest, Gratz, and Munich. Her greatest success was as Lucrezia in "Lucrezia Borgia," then (Nov. 24, 1843) given for the first time in the German language. Donizetti, who was at the time on a visit to Vienna, was so impressed with Mme. Stöckl's performance that he decided to give his opera "Dom Sébastien," on which he was at work, to the Vienna Opera, on condition that Mme. Stöckl should sing the part of Zayda. The opera was produced Feb. 6, 1845, under the personal direction of Donizetti; and this was the climax of the singer's career. Like her sister Sabine, Mme. Stöckl died insane. Her other sisters, Kathinka (born 1820; died Dec. 20, 1858), Fatima, Eva, and Nanette, were also singers of no little importance. Kathinka made her début in 1840 at Paris; went in 1842 to Brussels; returned in 1850 to Paris; starred at Hamburg, Berlin, Vienna, and Budapest; and finally settled at Freiburg-im-Breisgau.